This week over at Sunny Challenges and Creations, it was Vicky's turn to present the challenge. Vicky gave us this sketch and it was to be an Easter card. First up my thoughts turned to the usual Easter Bunnies, chocolate eggs, adorable little chicks and so on. When I eventually banished these images from my mind I came up with this creation. This is one of my favourite stamp sets. I love how you have used it for Easter. Wouldn't have thought of it but it looks amazing. Especially love the bling. 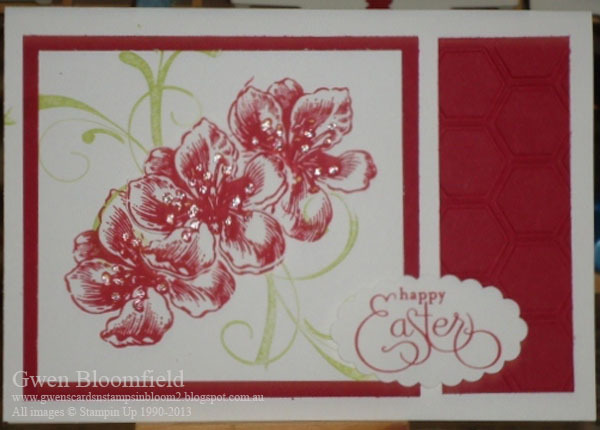 Love how you have used this set for your card Gwen - stunning. Love your colours too.